When bike enthusiast Dave Stoops moved to Portland from Connecticut in 2002, he was 18 and ready to get out on his own. Dave’s two sisters had already moved here and, when visiting them, Dave had the opportunity to experience the Pacific Northwest. He’d fallen in love with the wilderness outside the city — the Wallowas’ meteor showers, the high desert, the beautiful coast line and the forests. Discovering cycling as a young adult showed Dave he could live a healthier life by changing his mode of transportation. He began making a living as a bike courier. That mode would open his eyes to a lot more of what the world had to offer. Bike camping – or bike packing – is one of those offerings. It’s touring the countryside by bike. Survival items are loaded into bicycle bags called panniers. After a few stops and scenic surroundings, you reach your destination, set up camp and enjoy reflecting on your day with some fireside food and beverage. “I personally like this type of tourism because it lets you experience the world a lot slower than driving by in a car, but allows you to cover a lot more ground than back packing,” Dave said. Then the bike became his livelihood in 2007 when he started his own company, Black Star Bags to design and manufacture panniers. A housemate of Dave’s – and another cross country tourer – found a beat up sewing machine in a “free” box near their home at 14th Place and Killingsworth Street. It inspired Dave to start designing his own panniers. 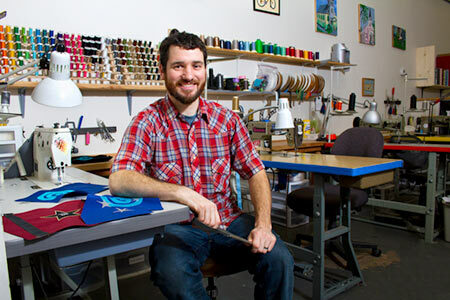 After a year of teaching himself how to sew, he began test riding a variety of prototypes. Soon, he opened a small shop on Alberta Street at 10th Avenue, which he outgrew and moved to southeast Hawthorne Street. in 2011.